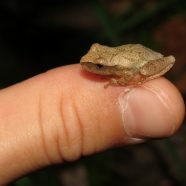 Spring peepers are little frogs with BIG voices. They’re hard to find, even harder to catch and impossible to forget. Don’t miss this opportunity to visit the research areas of South Mountain to search out Mother Nature’s “sleigh bell chorus”. In addition to spring peepers, we’ll also search for salamanders and other signs of spring. Advance registration required.